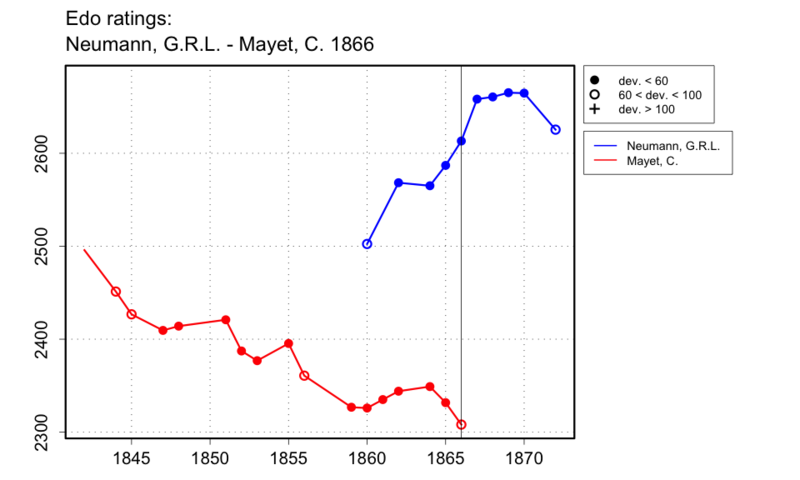 Di Felice gives a result of +6-0=1 for Neumann against Mayet in 1866. However, Renette and Zavatarelli make it clear that only six of these games can be considered a coherent set (with result +5-0=1 for Neumann), though not a formal match. These six were played quite rapidly on 16 Nov. 1866. Renette and Zavatarelli give another win by Neumann over Mayet, played three days earlier, but this is just one of many games they probably played, one that happened to be recorded. I cannot use random game scores for rating purposes, but I will use the 16 Nov. set.